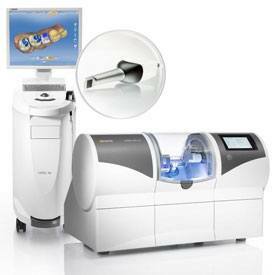 We now have the ability to make crowns in one visit using CEREC CAD/CAM technology. CEREC crowns are made from beautiful and durable ceramic. The ceramic comes in a wide variety of shades, and we can customize the color of your crown to deliver the most lifelike appearance. Historically, at least two office visits were needed to design, fabricate, and apply a crown. A dentist would first shape the tooth, make a mold of that shape, and then create and apply a temporary crown during the first visit. 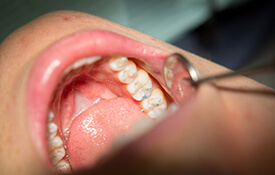 At the second appointment, the doctor would remove the temporary crown, fit and adjust the new crown, and then cement it permanently in place. With CEREC technology, the process of creating a crown is much more convenient, and the fit and quality of the crown is excellent. 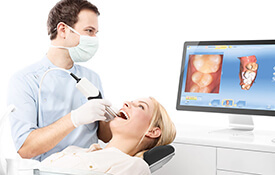 To start, I’ll prepare your tooth to receive a crown and take a digital image of the tooth with a special camera that is accurate to 15 microns. I’ll then design the crown on the computer, utilizing state-of-the-art CAD software. This takes only a few minutes. The CEREC milling unit fabricates the permanent restoration from a solid block of ceramic, then glazes it in a special oven at 900 degrees. This entire process takes either 30 or 60 minutes, depending on the type of material we use. You can relax, watch TV, or read a magazine or book while you wait. Some patients even run a quick errand during the milling process. When your permanent crown is complete, I’ll adjust the details and then permanently bond it in place for a seamless fit and appearance. I have used this technology on a daily basis since 2006. Our office is one of two in Petaluma to provide this advanced service to our patients. 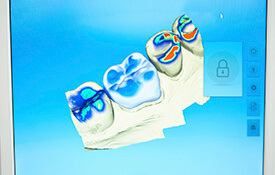 Why Choose a CEREC Same-Day Crown? Aesthetics. They look beautiful, as they are all ceramic. Traditional crowns often look phony due to the gold on the inside of the crown. The ceramic on the outside just doesn’t look natural. Light passes through all-ceramic crowns just like it does real teeth, which makes them look significantly more natural. Durability. Being made from a solid block of ceramic eliminates the junction between porcelain and gold, which is usually where traditional crowns break. Convenience. In today’s busy world, it is nice not to have to come back after wearing a temporary crown for two or three weeks. Cost effectiveness. Even though the technology is expensive initially, there is a cost savings for the dental office day to day. This allows us to provide this advanced service for the same cost as a regular crown. Think of it as a free upgrade. Amazing precision. The imaging is all digital. There is no need for messy impression materials or additional time-consuming steps, any of which can introduce a tiny bit of distortion. Instead, the digital image can be manipulated, with zero distortion, to any shape we need. The end result is a restoration with an amazingly precise fit. Very conservative. Immediate placement allows me to remove less tooth structure. This keeps teeth stronger and irritates them less. Read the details of a real patient case.